It is a direct counter for aggro. Agreed. I think this can be used as an alternative to zombie chow for control type decks for early game presence and the face damage from it won't be negated by the death rattle. Gadgetzan Jouster, win the battlecry, coin out a Zombie Chow? Sign me up! if you win the joust, it just buffs it to a 2/3, it doesn't summon an additional 2/3. "Sign me up!" ?? If it turned it into a zombie chow, nobody would include this over zombie chow, as it's strictly worse. Zombie chow has a negative deathrattle. You missed the "Coin out a Zombie Chow" part. As in you would also coin out a chow in addition to the jouster. I like the effect but isn't it a bit retarted since it costs 1 mana, and the only cards cheaper than this are the Wisp and the Target Dummy. 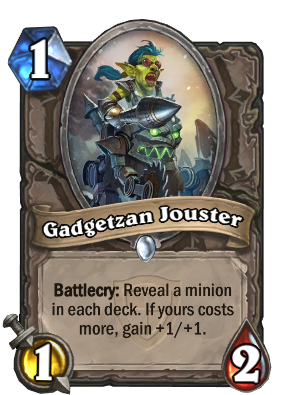 Battlecries triggers first, so buffed Jouster will not gain bonus from Hobgoblin. Not buffed Jouster will... but why would you play it in Hobgoblin deck then? Even Bloodsail Corsair better in this case. Not true. Minion lands on board then effects on boad take place juggler, hobgoblin, warsong commander etc.then the battlecry takes place. However battlecrys take priorities over secrets. worse zombie chow for control decks (you're risking it not working if it pulls the OTHER gadg jouster) , useless for aggro/midrage. who said you should put 2 of them in deck? If you play a control deck with only this as a one drop you can most certainly always play it as a 2/3 against a rush deck. What makes it better than chow is that you can also play it in the late game without worrying about healing the opponent out of range for your burst. Great value! That's going to replace Chow!! This will be a good card in arena.